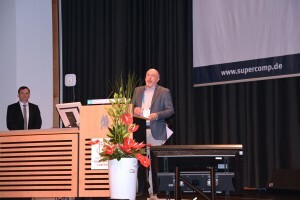 ISC14 (International Supercomputing Conference) announced on Monday the new TOP500 list, which classifies supercomputers according to their processing power, just this morning. 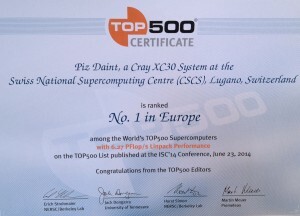 The list ranks Piz Daint of CSCS as the sixth fastest supercomputer in the world and absolute fastest in Europe. 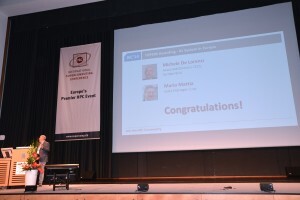 The photos here below show the award ceremony with representatives of Cray, ISC/TOP500 and CSCS. The supercomputer Piz Daint has 28 cabinets and features a hybrid architecture with NVIDIA Tesla K20X GPUs for a total of 5’272 compute nodes. 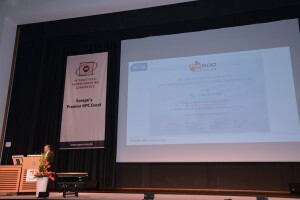 At 2.7 GFLOP/s/W Piz Daint is also the most energy efficient supercomputer among the top 50 in the list. 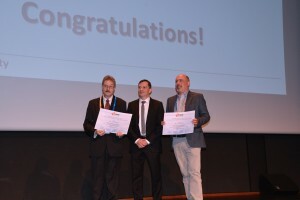 The list is updated twice a year and reports Linpack performance statistics for the world’s most powerful computers. The top five entries of the list remain unchanged from the last update in November 2013 and include the Chinese Tianhe-2 (33.9 TFLOP/s), two US supercomputers at DOE facilities, Titan at Oak Ridge (17.6 TFLOP/s) and Sequoia at Livermore (17.2 TFLOP/s), the Japanese K computer at Riken (10.5 TFLOP/s), and Mira at yet another DOE facility, Argonne National Lab (8.6 TFLOP/s).